The only thing that kept the week on track was the fact that I took time on Monday to meal plan – I had my breakfasts, lunches and dinners figured out until Friday night! It did a world of good and let me eat healthy and make time for exercise all week! This breakfast was so filling. If I had time during my morning, I found myself having a clementine as a healthy snack which got me through until lunchtime. One day I knew I was not going to have lunch until after 1 o’clock and I had a few minutes around 10:30 – I was hungry and I knew I needed something to get me through until the afternoon, so I had a low sugar Kind bar. That did the trick! I love Kind bars when I know I need something that will keep me going for a few hours – as long as it is one of the low sugar bars. 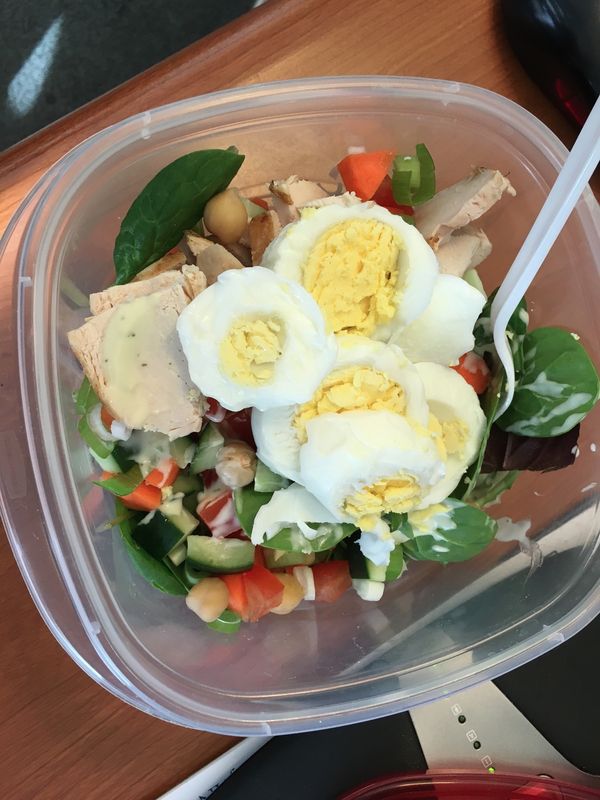 By Friday I was out of my grilled chicken, but I still had my salad and it was almost just as good with just the hard boiled egg for protein. Every day at lunch I went for at least a twenty minute walk outside. We had some unusually warm weather this past week – so a couple of times I managed to get in my 30 minute walk which was wonderful! On Monday night I did not have a plan for dinner. We had been away this weekend, and I had food to get me through the snow storm, but nothing really for the week ahead. After a long day at work, I made myself stop at Whole Foods to get ready for the week. Because of this stop I did not get home until 7pm. Thankfully I was able to pick up a few things at the Whole Foods prepared food area so SC and I could have a decent dinner. I definitely felt like Whole Foods saved us from ordering take out or having cereal for dinner! 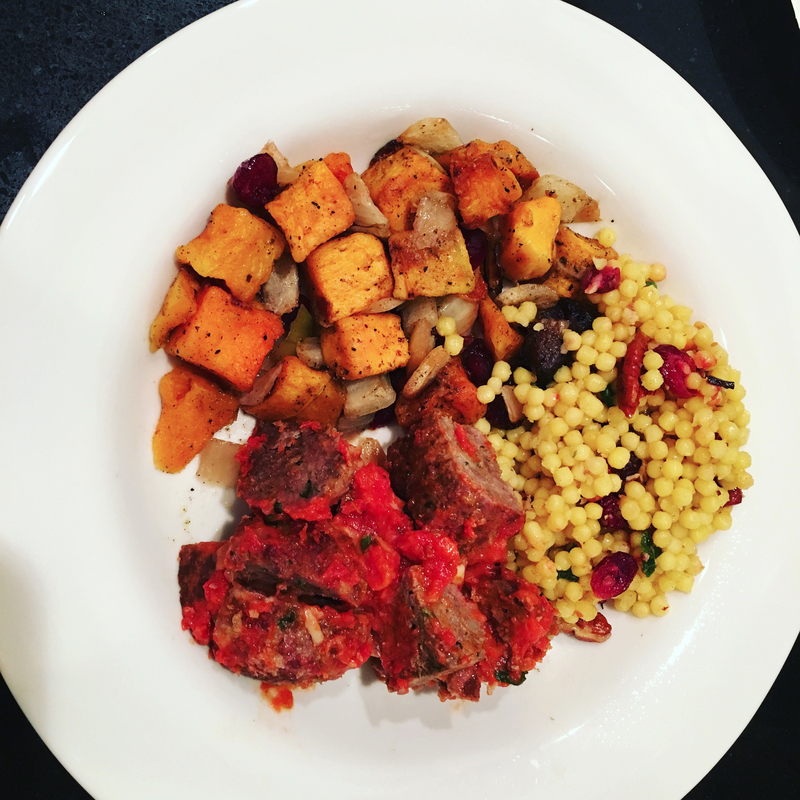 That night I picked up a couple of grass fed beef meatballs (we had one each), roasted butternut squash and at the SC’s request – his favorite cranberry couscous. It made for a very interesting dinner! 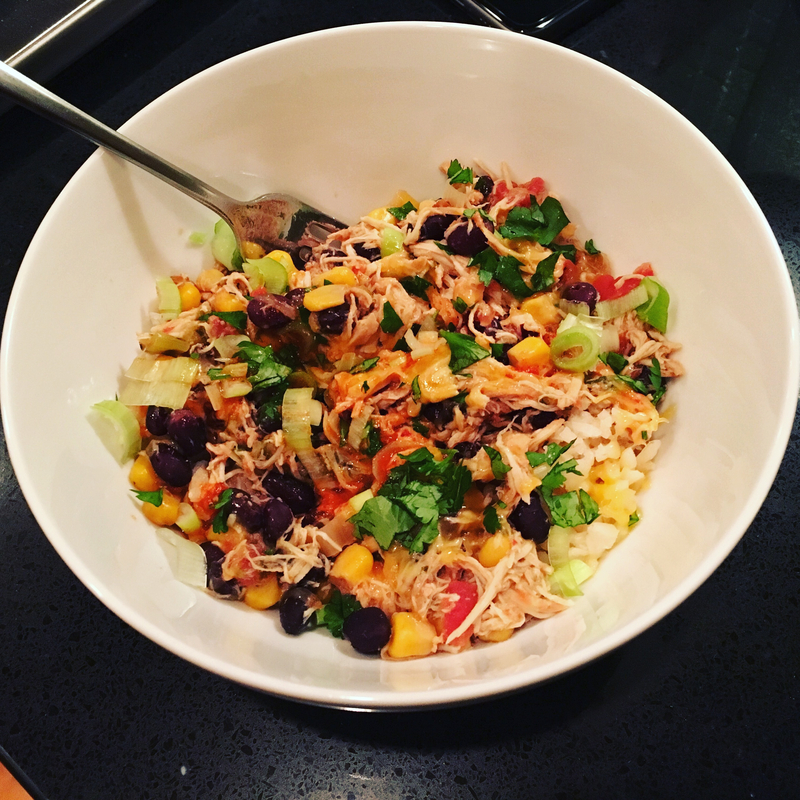 While I was at Whole Foods, I picked up the ingredients to make one of my favorite crockpot meals – Skinnytaste’s Santa Fe Chicken. We love this pulled chicken dinner – and I ate it for dinner Tuesday, Wednesday and Thursday this week! It is a healthy and protein packed dinner. While the SC was working from home on Tuesday, he put all of the ingredients into our crockpot and when I got home the kitchen smelled amazing. We made a batch of brown rice to go with dinner on Tuesday that lasted until Thursday night too. The toppings make a big difference with Santa Fe Chicken. I always have to have scallions, cilantro and a couple of drops of hot sauce – I sprinkle a little shredded cheese on top too. If you have a busy week I highly recommend making a big, healthy dinner early in the week that you can have for a couple of nights in a row. Because I did not have to worry about dinner this week I was able to get on the treadmill every night after work – and because I did that I slept well and felt healthy all week, which is always a wonderful feeling! I am already coming up with my plans for the week ahead… soup for lunch maybe and I haven’t come up with an idea for dinner yet – stay tuned!